A House lawmaker is aiming to block a portion of recently announced changes to the rules governing the transfer of education benefits through the Post-9/11 GI Bill to a service member’s spouse or dependent. In July, the Defense Department announced that it would shorten the amount of service needed to transfer GI Bill benefits to a family member, citing the need to recruit and retain new service members. But the new policy also included an upper limit on when an active duty service member can transfer those benefits. Under the current policy, service members can transfer GI Bill benefits to a family member at six years of service if they commit to an additional four years of active duty. The new policy, which is set to take effect in July 2019, would allow the transfer of benefits at six years in all cases, but it would also sunset after 16 years of active duty. 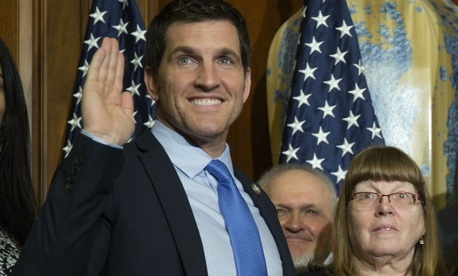 Rep. Scott Taylor, R-Va., introduced the GI Bill Transfer Extension Act (H.R. 6769), which would remove that 16-year deadline, retroactive to 2009. “Such regulations may not provide for a limitation on eligibility . . . based on a maximum number of years of service in the uniformed services,” the bill stated. Taylor said in a statement that the bill would preserve "flexibility" for military families as they plan for the future. Timothy Foster, a spokesman for Taylor, said the bill is not a direct response to the Pentagon’s policy change in July. “This is something Rep. Taylor has been working on and discussing with staff for some time, prior to the DoD announcing a policy change,” Foster said in an email. First Command, a company that provides financial planning services to military families, described the new Pentagon policy as a “tightening” of rules on education benefit transferability, and reported that 75 percent of officers and senior non-commissioned officers surveyed are considering changing their savings habits to compensate for the possibility that they will not be able to transfer benefits to a family member.